This article is written just following our bidding farewell to our Holy Father, Pope Francis. It is my hope that this account will be an upfront and personal witness to what I, myself, experienced these past few days. On, Tuesday, Sept. 22, I traveled, along with my Auxiliary Bishops Chappetto, Massa and Sanchez, to Washington, DC, in preparation of the Sept. 23 Mid-day Prayer with the Holy Father followed by his talk to the Bishops of the U.S. at St. Matthew’s Cathedral. It was an extraordinary talk, delivered in Italian which meant that I did not need to use the earphones provided for translation. I was able to listen carefully, as the Holy Father gave, in a poetic way, uplifting and challenging instructions to his brother Bishops. One phrase sticks in my mind. Pope Francis told the Bishops that when they preach they should leave the people with a “taste of eternity.” What a wonderful way of understanding the need of our age. Recently, two resigned priests of the Diocese of Brooklyn, one a sociologist and one a psychologist, sent me a book in which they documented an ethnographical study asking people why they left the Catholic Church. As I read the book, I saw commonalities. The first is that people lost their belief in eternal life; second is the loss of the practice of the faith and finally the denial of even the existence of God. The first comes in the denial or the lack of faith in eternal life. Our preaching must give people a sense that there is more, that this present life is only the beginning and we must rekindle our faith in divine love which prepares us to meet love itself in the Kingdom to come. At the Mass of Canonization for Blessed Junipero Serra, at the Basilica of the National Shrine of the Immaculate Conception that same day, Junipero Serra became an American saint, even amid controversy. Perhaps the understanding of what makes a person a saint is what was at stake. The criticism of the Holy Father in canonizing this now controversial figure who was made to seem responsible for all the ills of the colonization at that time, but none of its good results. The colonization of California by the Spaniards is hard to evaluate in retrospect. Could the Native Indians have been able to build the culture that laid the foundation for modern California? Perhaps not, but there were ill effects and there is no doubt that the Spaniards brought diseases to which the Native Indians had no immunity. Some claim that they were enslaved forcefully and made to work for the economic gain of the Franciscans. That is the negative view. However, the positive view also is what made Junipero Serra a saint, for his defense of the Native Indian population and his ability to see that protection in the midst of colonization was so necessary. He followed the lead of other saints such as Peter Claver, S.J., and Bartolomé de las Casas, O.P., who both were defenders of the slaves and of native populations. Saints do their best and strive for sanctity; they cannot change the whole world around them. This is a lesson for us all. 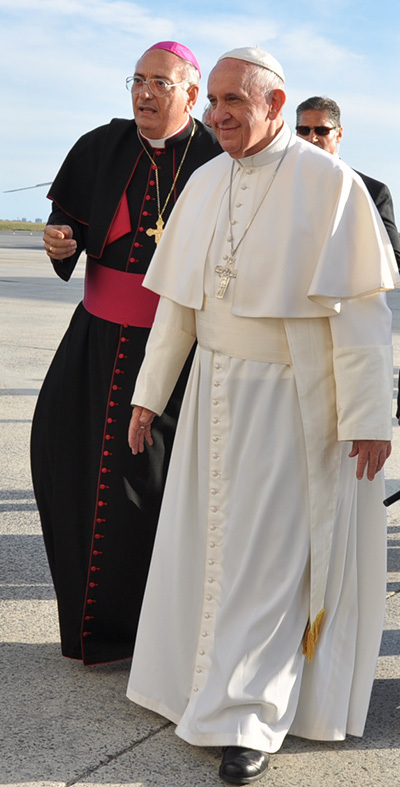 At the welcome of the Holy Father to New York City at John F. Kennedy Airport, as Bishop of Brooklyn, I was privileged to be the first to welcome Pope Francis to the Diocese in Brooklyn and Queens. Cardinal Dolan was standing right behind me and we both saw an energized Pope who went directly to the sick and young people who had gathered to greet him. He embraced them lovingly and touched each one of them. When he came to a 100-year old woman, Mary Frances Carruba, who came from Queen of Peace Nursing Home sponsored by the Little Sisters of the Poor in Queens Village, the Holy Father spoke to her in Italian and gave her a special Rosary. His love of humanity is more than evident in each contact with those whom he meets. Not only was it a look toward the past, but we must take it to the future. What will the future of the Church be in our country without the presence of Consecrated Religious. The challenge is that we must work harder. There are vocations to religious life of women. At a recent youth rally at St. John’s University, over 100 young women came to the altar for a vocation call when they were challenged, “Would you accept Religious life?” The willingness is there, and this is something which we must act upon to encourage these vocations. It was an uplifting experience beyond imagination. This inter-religious gathering brought together representatives of religious groups: Christian, Jewish, Muslim, Sikh, Hindu, Buddhist, Orthodox, Jain, Native American and Zoroastrian. It was a time of prayer and reconciliation for the great evil that was perpetrated on that spot, which the Holy Father did not hesitate to mention, while at the same time praying for the gift of reconciliation. The wonderful singing of the Jewish cantor was a highlight of the ceremony, as well as The Young Peoples Chorus of New York City who sang with angelic voices to conclude the prayer service. The Holy Father requested that he have an opportunity to visit a Catholic school and a visit to an immigration support center. He accomplished this in one visit to Our Lady Queen of Angels Catholic School in Harlem. In the mid-afternoon, Pope Francis first met with the school children who interacted with him in a lively manner. He then met with various groups of immigrants who presented the Holy Father with various gifts. His interaction with these people brought smiles to his face. During his trip, Pope Francis emphasized more than once care for the stranger and hope for a willingness in our own country to take some of the refugees from the Middle East. He asked for us to serve the newcomer as the Gospel recommends with charity and wisdom. The ride through Central Park which I was privileged to be a part of in one of the cars following the Holy Father was truly amazing. The throngs of people who accessed the special website online to have a chance to receive a ticket for entrance into Central Park truly allowed Pope Francis to recognize that the people not only see him as a world figure, but one who is loved. I, myself, saw tears in so many of the eyes of people in the crowds along the route. As we proceeded to Madison Square Garden for Mass, Cardinal Dolan and I were pained by listening to the reports of how long people had to wait in line to enter the arena. But once inside, the inconvenience faded from the experience of all. So many of the people I personally spoke with said this was so because the Holy Father brought a certain joy beyond explanation to all those present. His simple yet profound remarks were something that we truly cannot forget. As I have tried to place Francis in the following of the Pontiffs before him, this trip made me understand where he fits. Saint John Paul II announced the New Evangelization. He told us that it would consist of new methods, new zeal and new evangelizers. Pope Benedict made it clear, with his wonderful gift of teaching, that the new evangelizers would be the laity, imbued with zeal for the Gospel. And now Pope Francis has brought us a new method of evangelization. It does not consist so much in words, or even the annunciation of doctrine, but in the Gospel of Joy that he has enunciated. Pope Francis has caught the attention of people. We cannot evangelize anyone unless they are listening. The world is listening to Pope Francis because he has touched the things that matter to him. For example, in his Encyclical “Laudato Si: On Care for Our Common Home,” the environmental crisis which we face is front and center. There will be a time when the other issues become more clear. He avoids none of them, but emphasizes those which attract attention, a willing ear and an open heart. In addition, on behalf of the faithful of Brooklyn and Queens and in thanksgiving for a safe journey, the Sisters presented him with a bouquet of white roses. I, myself, was pleased to present to the Holy Father a book which held photos of the national Marian images which are located in the roundels at the Co-Cathedral of St. Joseph. In the book, I also pointed out to him a photo of Dorothy Day who is included in the mural of the saints and saints-to-be of the Americas. Pope Francis mentioned Dorothy Day in his message to the Congress. He said, “Send the information to Rome for her canonization.” As you may know, Dorothy Day was born in our Diocese, as was Thomas Merton. So we have the seeds of saints among us which will continue in the future as we strive to implement the New Evangelization among us. And finally, as I write this article, I did have an opportunity to watch the Festival of Families in Philadelphia, where an animated and rejuvenated Pope spoke in his native Spanish to a crowd of more than one million people. His straight talk is understandable to all. His humor, which comes from real life experiences was appreciated by all. The emphasis on the family, the talks by the families from five continents were equally moving. I especially liked his emphasis on the generational responsibilities of passing the faith from one to another and recognizing that the care of the young and the old will be what saves the world for the future. Our Holy Father, Pope Francis, certainly put out into the deep as he came to the United States. Although the currents in our own country are diverse and the time treacherous, I believe that he was able to find a path that will leave a legacy of hope and love, as significant characteristics of the Church of Jesus Christ. Thank you, Bishop, for sharing some of your experiences of the Pope’s visit. I particularly like the reminder that we are living an eternal life. While I waited with my wife for almost 4 hours to gain admission to Madison Square Garden, it is nothing compared to the wait of the suffering poor for the Kingdom of God. The opportunity to join in the sacrifice of the Mass with our earthly spiritual father was a blessing of a lifetime. Let’s pray the graces of his visit stay with us forever.